Biscuit - rediscover reddit, on your iPad. For some people, reddit is all about the frenzied information overload experience. In a way, it's like those 10 hour long YouTube videos: let's see how long you can endure. We see reddit differently. We want to focus, dive deep, and read with dedication. So we built a reddit client for iPad to rediscover the reddit we used to love. A reddit beyond information overflow, far away from the wall of text you get in the browser. We paid close attention to layout, typography and visual appearance. We poured in everything we learned about touch interaction since the iPad came out. Biscuit is pure iPad, and it feels right at home on iOS 7. But foremost, Biscuit is about the joy of following discussions. 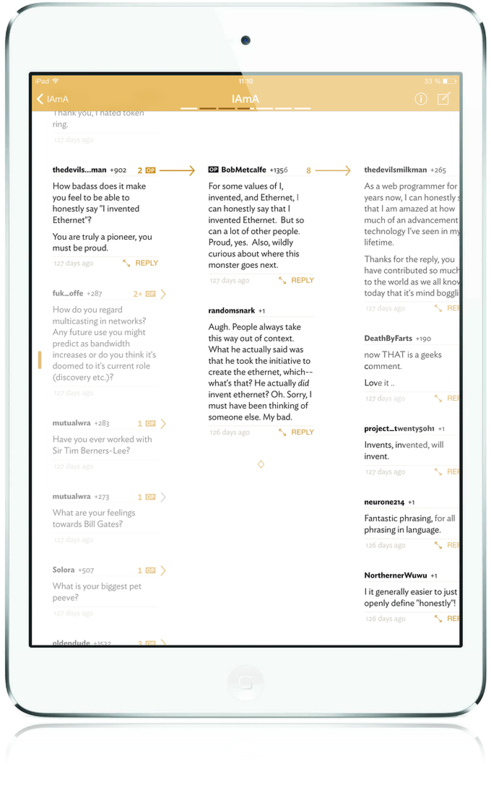 Instead of the web reddit wall of text experience – stimulative as it might be for some – we use an infinite canvas to arrange the comments in two dimensions; horizontally to drill down into an argument, vertically to read all the immediate replies. Reading becomes choosing what you want to see. Because interaction is swift and smooth, this is a rather enjoyable experience. Biscuit preloads all comments you could choose to see next. Also, it indicates buried OP replies. We built in single-gesture voting and replying, because we believe that this kind of interaction is the backbone of reddit. Like so often, it is hard to describe. Try it and you will discover a whole new way to enjoy reddit. Reading experience in Biscuit is optimized for following discussions. This is ideal for going through discussion-heavy subs like IAmA, AskReddit and TIL. And don’t forget that you can set a column width that fits your needs with a simple pinch gesture! Suddenly, making friends on reddit makes sense; Biscuit highlights your friends’ comments, so you always know whom you can trust (or better don’t trust). Also, it marks OP-comments, and shows you where OP-replies are hidden. Vote and reply with easy to remember two-finger gestures: swipe up on a comment to vote up (and reverse), and swipe right to reply. Once you type your reply, you will find extra markdown keys, and even a ಠ_ಠ key. We hope you approve. » Fully-featured reddit client for iPad, including moderator commands. » Sync read submissions with reddit.com (reddit gold). » Helps you find the best content on reddit by highlighting all comments of the OP and of your friends. » Make new friends, right inside of Biscuit. » Unprecedented comment layout, based on scientific study, adapted for tablet interaction. » Easily quote other users in the comprehensive posting interface that offers special markdown keys. 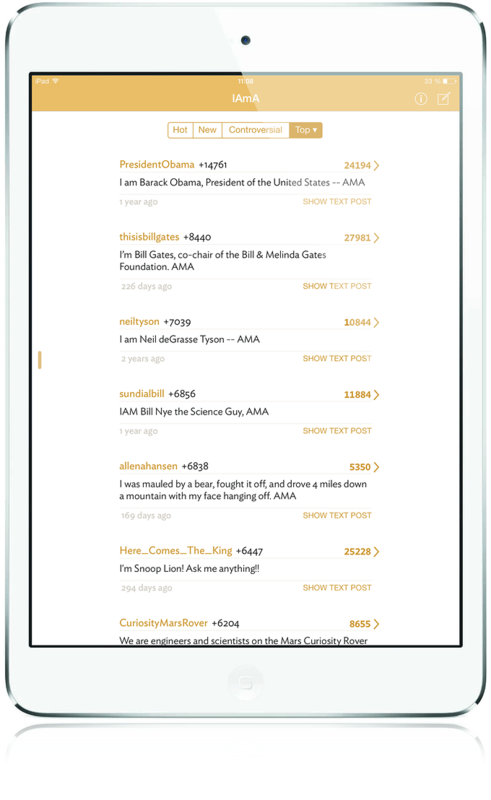 » Smart loading of more than the usual 200 comments as you read, no need for you to do anything. » True iOS 7 app: support for system-wide font settings and background notifications for new messages. » Upload images from your iPad camera roll and directly include them in your posts or comments. » Never miss anything - Biscuit highlights all new comments since your last visit. » Make it yours: customize the column width, post spacing or the color of you and your friends. » Responsive and fluid interaction with easy-to-remember two-finger gestures for voting and replying. » Sharing includes Safari Reading List and cross-post on reddit. Matthias Tretter (implementation & magician). Also, we owe you one, Peter Holzkorn.